This stir-fry is made with my favorite vegetables and my homemade stir-fry sauce. Not only is it delicious but it’s packed with too health benefits to list! 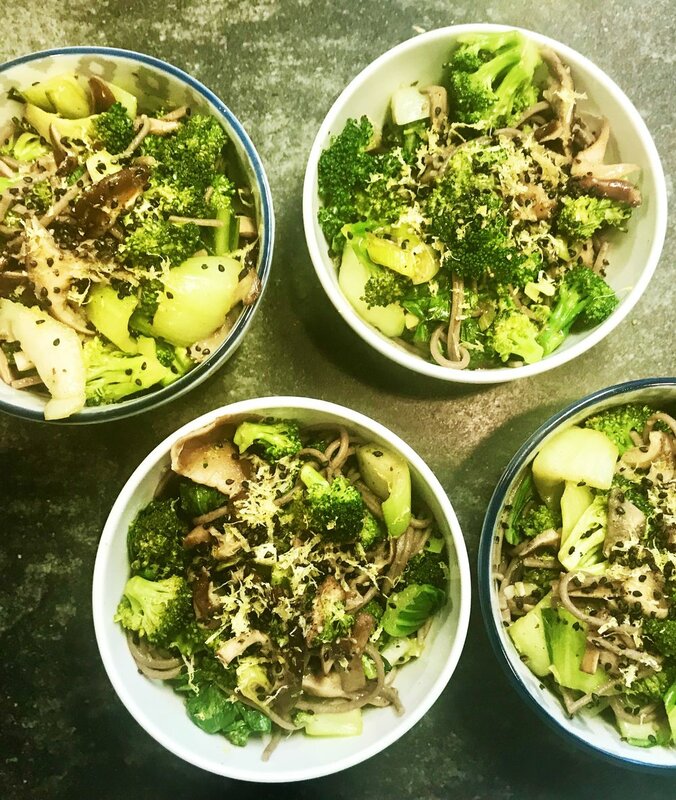 Served over protein-packed, gluten free soba noodles makes it an ideal dish that’s great on it’s own or can pair well with any additional protein! Prepare the stir-fry sauce by combining the ginger, tamari, coconut aminos, vinegar, sesame oil, scallion and garlic. Set aside. Steam the broccoli florets in a steamer basket until bright and green. If you don’t have a steamer basket you can bring a medium saucepan of water to a boil and boil broccoli for about 30 seconds to 1 min. Remove from water and set aside. Repeat above for the bok choy. Set aside with the broccoli. Bring water back to a boil and cook the soba noodles according to the instructions on the package. Strain when done and set aside. Melt olive oil and 1 tablespoon of butter or ghee in a large sauté pan over medium high heat. Add mushrooms and cook, tossing occasionally, until tender and golden brown, about 6-8 minutes. Reduce heat to medium and add broccoli, bok choy and prepared stir-fry sauce to the mushrooms. Add and melt the remaining tbsp. of butter and cook together for a few minutes, coating all the vegetables in the sauce. Fill bowls with a portion of the soba noodles and top with the vegetables. Add additional sauce on top if desired. Garnish with lemon zest and sesame seeds.